Georgia O’Keeffe is best known for her paintings of magnified flowers, animal skulls, and New Mexico desert landscapes. 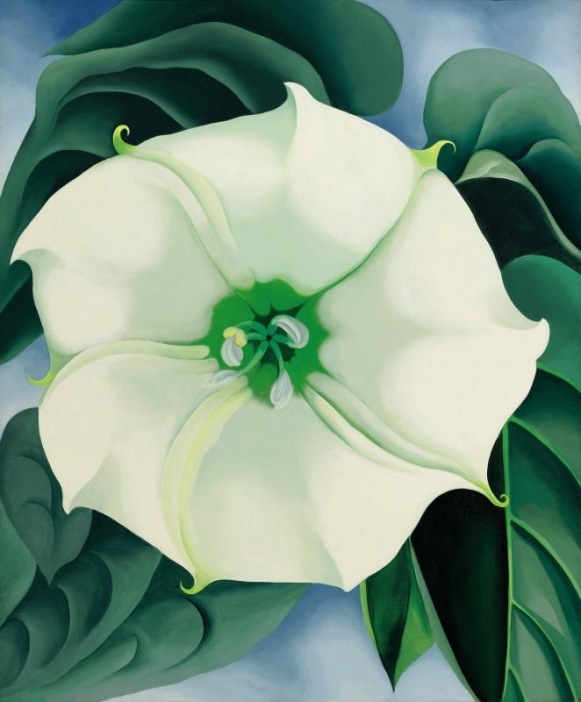 This exhibition brings together some of her most important works, including Jimson Weed/White Flower No. 1 1932, the most expensive painting by a female artist ever sold at auction. The painting of a humble garden weed is being loaned to Tate Modern from Crystal Bridges Museum of American Art in Arkansas. This will be the first time the work is displayed outside the US since being acquired by the Museum in 2014. It is the most expensive painting sold at auction by a female artist. The Jimson weed bloom is native to New Mexico and the focus O’Keeffe affords it in the painting reflects her growing affinity with the region in the 1930s - an association that would continue throughout her lifetime. Being fond of this particular plant, she allowed Jimson weed to flourish around her patio at her home in Abiquiu and made it the subject of multiple works, each time presenting a new viewpoint. The frontal perspective on the flower in Jimson Weed/White Flower No.1 1932 and the symmetry this gives the composition, makes it a particularly striking work in the series. The painting reveals the profound influence O’Keeffe took from modernist photography – its concern with the study of form, use of close up or magnification and cropping - a practice that was influenced by her professional and personal relationship with husband and photographer Alfred Stieglitz (1865-1946), as well as her close friendships with a number of other photographers. Widely recognised as a founding figure of American modernism, O’Keeffe gained a central place within the avant-garde art scene between the 1910s and the 1970s. Spanning the six decades in which O’Keeffe was at her most productive and featuring over 100 major works, the forthcoming exhibition at Tate Modern will chart the progression of her practice from her early abstract experiments to her late works from the 1950s and 1960s, aiming to dispel the clichés that persist about the artist and her painting. With no works by O’Keeffe in UK public collections this exhibition is a rare chance to see the beauty and skill of her remarkable paintings outside the US. Georgia O’Keeffe opens at Tate Modern on 6 July 2016, curated by Tanya Barson, Curator, Tate Modern with Hannah Johnston, Assistant Curator, Tate Modern. The exhibition is organised by Tate Modern in collaboration with Bank Austria Kunstforum, Vienna and the Art Gallery of Ontario, Toronto.